The Corsair K63 Wireless is a mechanical keyboard first presented at the CES (Consumer Electronics Show) in Las Vegas in January 2018. Only a few months after the launch of the wireless Logitech G613, it is now Corsair’s turn to get rid of the cords and present the Corsair K63 Wireless, the manufacturer’s first wireless mechanical keyboard. Connectivity is ensured by a small Bluetooth receiver that can be attached to the computer via USB and allows wireless use. Alternatively, the keyboard can also be connected and used with the supplemented USB cable. To protect privacy in wireless operation as well, transferred data are encrypted with a 128 bit AES algorithm. As specified by the manufacturer, the integrated rechargeable battery of the Corsair K63 Wireless has a service life of up to 75 hours as long as the background lighting is turned off. It lasts up to 25 hours without recharging when the brightness is set to low and up to 15 hours with normal brightness. The lighting can be configurated using the Corsair Utility Engine (CUE), which offers the user numerous effects and setting options. The keyboard is a new version of the tethered Corsair K63. As the manufacturer only added the word “Wireless” to the new product, one might assume that the possible wireless operation is the only difference between the two models. As a matter of fact, there are several features that set the versions apart. 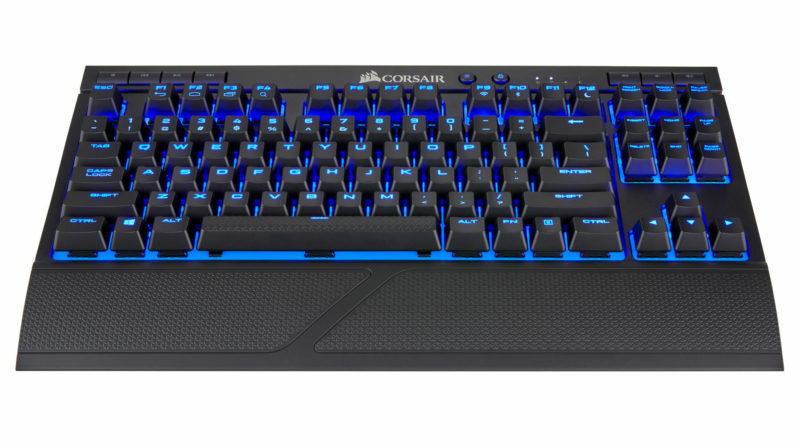 While the keyboards look almost alike and both versions are equipped with Cherry MX Red switches, the background lighting of the Corsair K63 Wireless is not red like its predecessor’s, but blue. It also comes with a wrist rest and boasts several additional multimedia shortcuts. The Corsair K63 Wireless is a compact, tenkeyless keyboard, which makes it perfect for controlling the computer from the couch or the bed. The usual problem in such cases is the fact the user has to make do without a mouse. The separately available Gaming Lapboard by Corsair is intended to change this and facilitate a fully fledged desktop gaming experience from the comfort of the couch. The lapboard is a rack constructed to perfectly fit the dimensions of the K63 Wireless. It provides a built-in mouse pad on the keyboard’s right. A wireless mouse in not included in delivery, but Corsair, Logitech, and other providers offer a wide enough range to choose from. The underpart of the lapboard is padded with memory foam to guarantee comfort and stability. "Corsair's K63 is only the second wireless mechanical keyboard from a mainstream manufacturer, and the first with backlighting. The battery's a bit short, but everything else about it is fantastic." "Corsair hit the nail on the head with the K63 Wireless. It delivers everything you need to go wireless and game in the dark, all while keeping the cost down so that anyone can afford it and appreciate it." "Corsair's wireless gaming combo is pretty good, but small annoyances hold it back from true excellence." "If you’re after a wireless gaming keyboard, it doesn’t get better than this." "Corsair takes the already fantastic K63 and makes it a wireless keyboard that sacrifices almost nothing to ditch the cord. For clean gaming setups and the ultimate couch-side PC experience, there’s no better option." "The K63 Wireless is undoubtedly a solid first wireless keyboard from Corsair. For £120 I’d have liked a slightly more interesting design, but the 2.4GHz connection is excellent for all you wireless gamers out there."